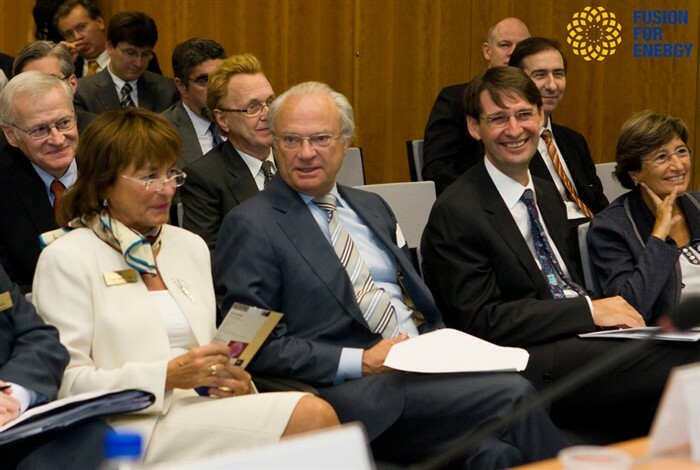 A delegation of 30 high level entrepreneurs, scientists and policy makers have been selected by the Royal Swedish Academy of Engineering Sciences (IVA), whose patron is His Majesty King Carl XVI Gustaf of Sweden, to visit Spain and learn more about different European projects in the areas of energy and environment and the ways that industry and research can help one another to create growth and jobs. The objectives stem directly from the three priorities set by the Swedish EU Presidency – sustainability, solidarity and security – which ends at the end of this year. Together with b_Tec (Barcelona Tecnologica), F4E co-organised an information day where they presented their activities and presented activities that could promote cross- European collaboration across universities, centres of research, industry and SMEs. Didier Gambier, Director of F4E, together with Miquel Barceló, President of b_Tec, offered a warm welcome to the Swedish delegation before the information session kicked off with presentations by both parties. Samina Shamsie, F4E Information and Communications Officer, moderated the session offering a dynamic and interactive style to questions and answers from the audience. Miquel Barceló, reported on the different innovation clusters that b_Tec is coordinating and highlighted its three knowledge vectors: energy, water and mobility. Paul Thomas, F4E ITER Department, offered an account of the different merits that fusion presents and the progress of the ITER experiment. Philippe Corréa, F4E Contracts Department, presented the current and future procurement packages that F4E is managing and explained ways that Swedish industry could be involved. The session closed with an exchange of gifts between the three parties and a round of refreshments which allowed people to connect and exchange useful contacts.